“I’m cheap” thing by now. I know.. but hey, it works for me! to celebrate the holiday in our home. 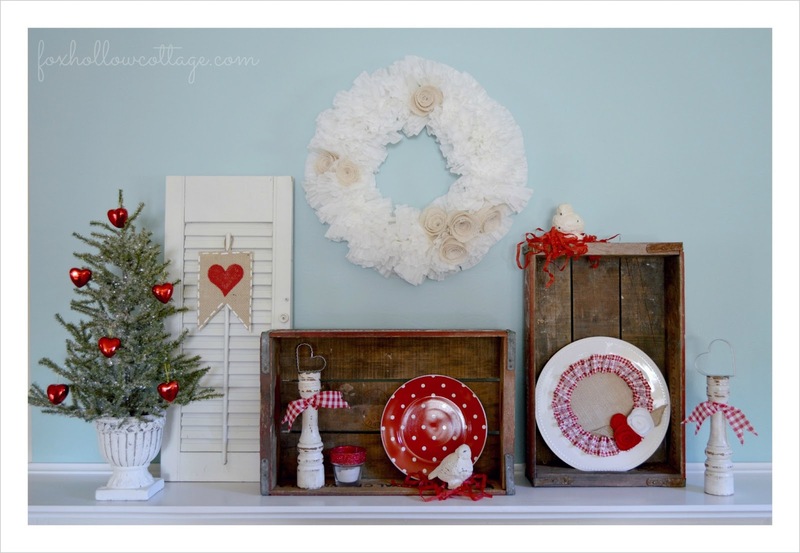 I get to change up my house, craft and decorate for the holidays, pretty much guilt free. 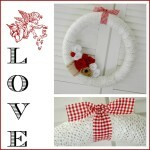 I love getting crafty and making new things without blowing my budget. I actually like being a thrifty girl! In fact, I’m so used to it, I can hardly stand to pay retail. Well, if you call Ross and HomeGoods retail. Okay, “budget retail”. 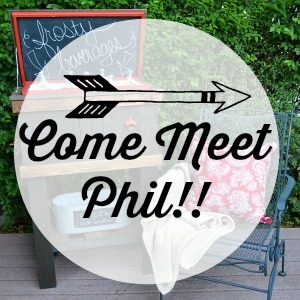 Since decorating is pretty much far from a necessity, I feel like I can do what I like if I keep it under control! 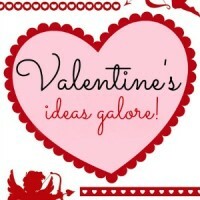 Crafting, shopping for deals and thrifting make all the fluff and frosting I crave possible. For instance, I found this picture out thrifting and picked it up for only $10 bucks. It took a bit of looking… I knew I wanted a frame with lots of scrolls and fancy swirls… and I knew I wanted it for a song. My hunting paid off. It needed some work, but with a little spray paint and some chalkboard paint.. 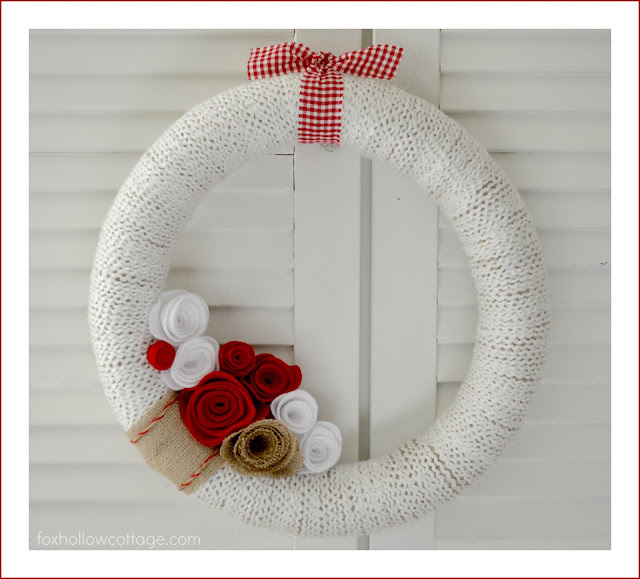 I now have a super backdrop for all those silly Dollar Tree pool noodle wreaths I like to make so much. you can find the tutorial by clicking this link HERE. You’ll be seeing more… I think I’ve got about a dozen in my craft room. I stocked up. Like a squirrel saving for Winter. 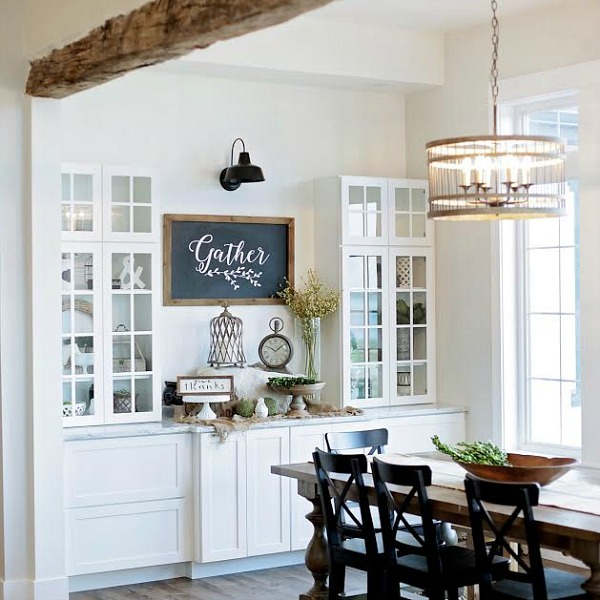 I know I am not the only gal out there loving the burlap craze. Thank goodness it fits our totally casual lifestyle! It’s super easy to work with and that makes it a great fit for my craft ability and limited patience. I’m an instant gratification sort of gal. It being super cheap is an added bonus. 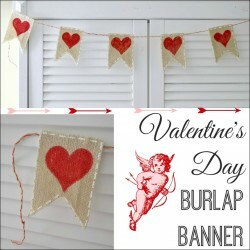 I can see burlap being a staple for years to come. 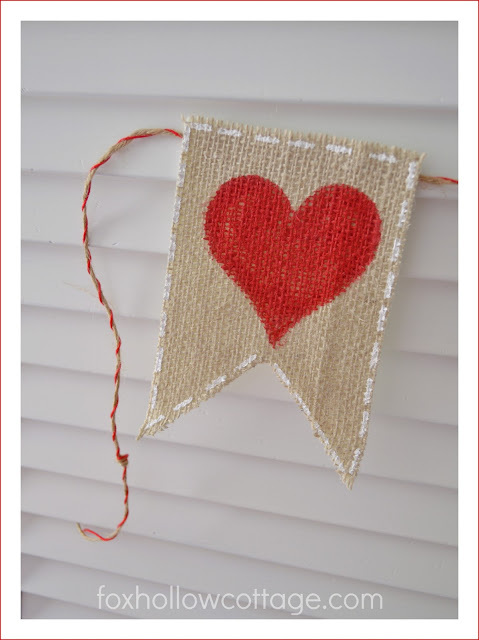 Make a simple burlap banner with painted red hearts a faux stitching. 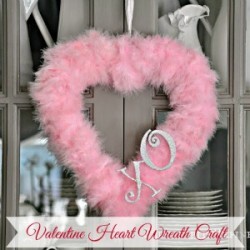 Find the Valentine’s craft tutorial HERE. This is a buck votive from the Dollar Tree. 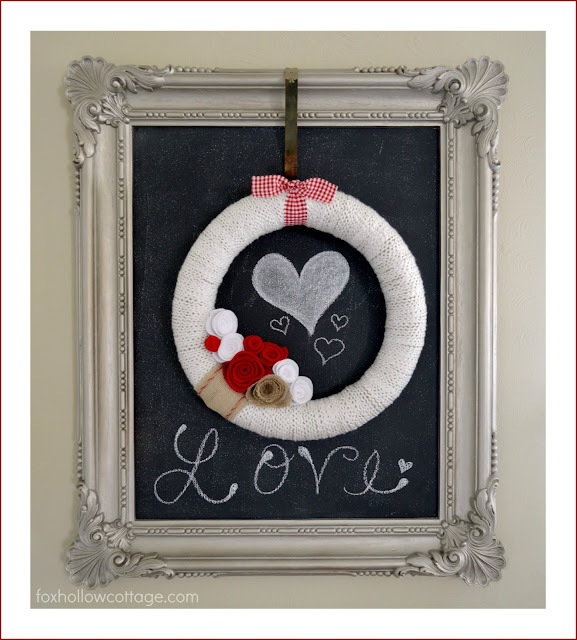 A sweep of Mod Podge and a healty dose of Martha Stewart glitter made it a wee gem in my book. The glitter just does it for me! 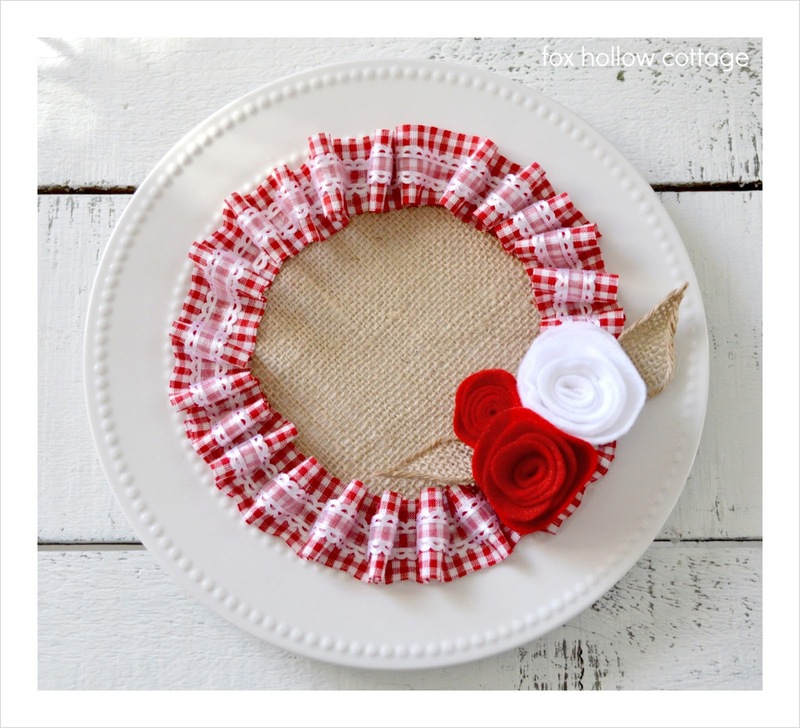 Dollar Tree decor – Burlap ruffled Valentine’s plate tutorial. Another Dollar Tree item that got a spruce up was this white dinner plate. 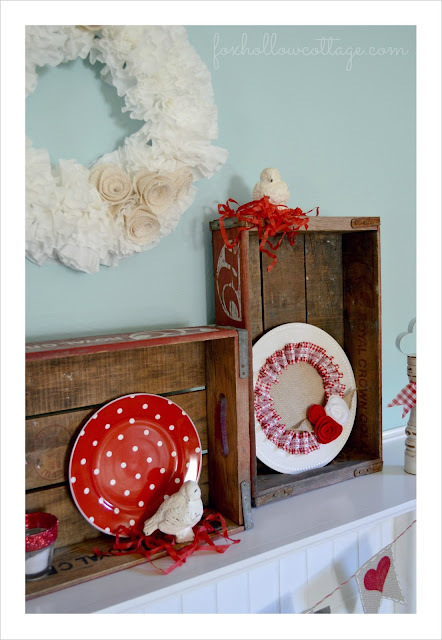 I think this would look really cute in a plate rack for display, or even in a set of two or three hanging on the wall. I propped mine up in one of my vintage RC cola crates on the mantel. A thrifty-crafty diy style Valentine’s Day Mantel. I’m still loving our fireplace face lift… and as much as I love my aqua, I think it’s time for a change. Any suggestions for a new accent color? 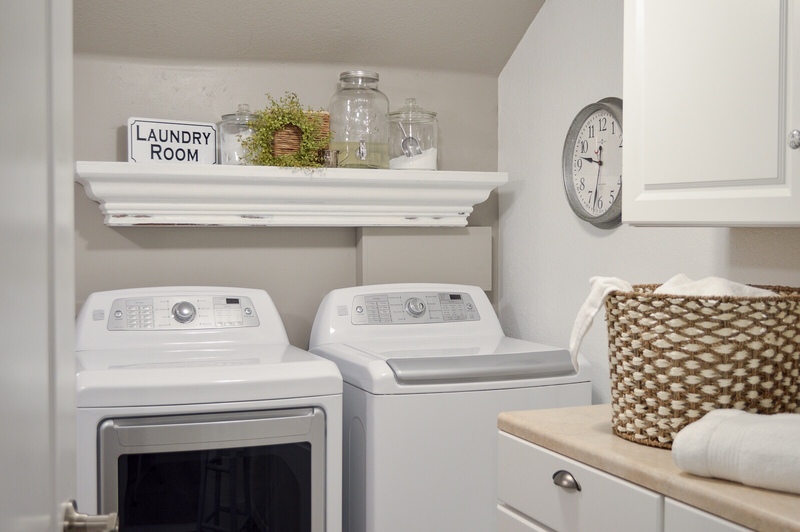 Is it completely boring to go white? I think might like the freshness of it! 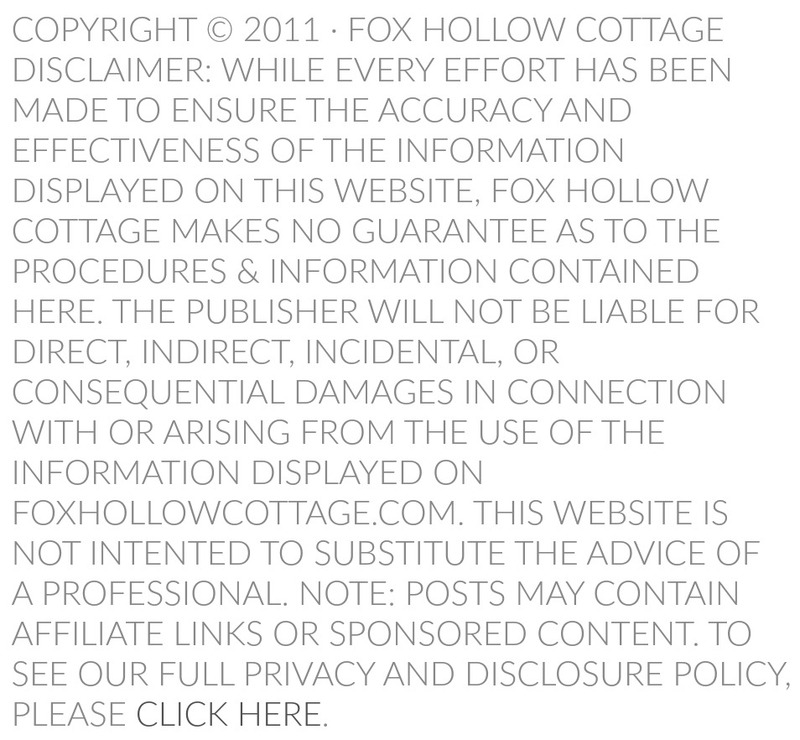 It’ll be popcorn and action for us. This is beautiful! 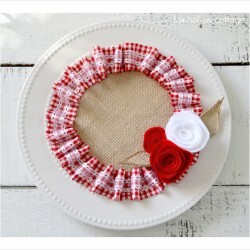 Love that white plate with the burlap and ruffles the most. 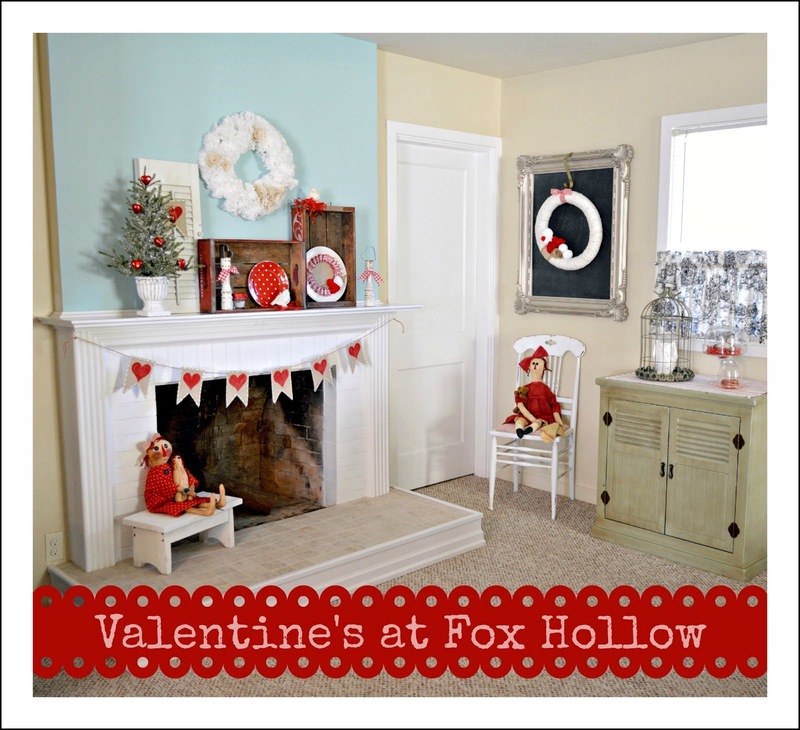 I have no decorations out and no plans for Valentines day…how bah-humbug am I? I feel you on the retail. After making my own decor for so long when I go into stores I about have a heart attack at how much stuff costs. I’ve even been known to complain about how much goodwill charges, lol. oh my goodness you put me to SHAME. I have um…2? candles. I cut out a couple hearts and put ’em on another 2. That’s it. You BLOW ME AWAY with your decorating! Holy moly! 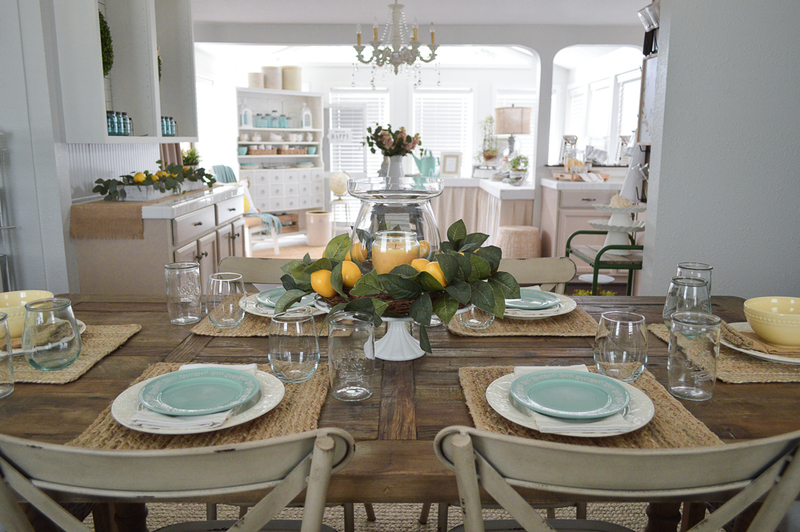 The last pic just brings it all together — so fresh and inviting. I love it! Awesome round up!!! 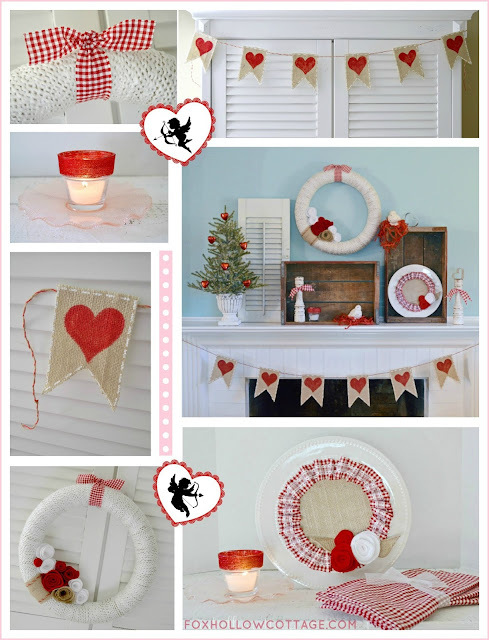 Your mantel is beautiful! I’m on my way for chocolate and champagne!! Gorgeous! You are the queen of thrift and do it in such cute ways. 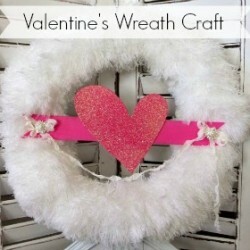 I have loved every one of the beautiful crafts. 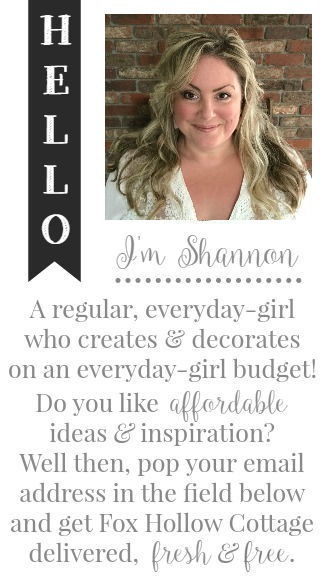 Oh Shannon I love your thrifty side. I agree it’s hard to pay retail. I like to change things up so much that if I did pay retail it’d be scary. All of your décor is so cute. Your house looks adorable!! 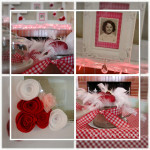 I love all of your valentine decor! I love your Valentine’s Day decor. 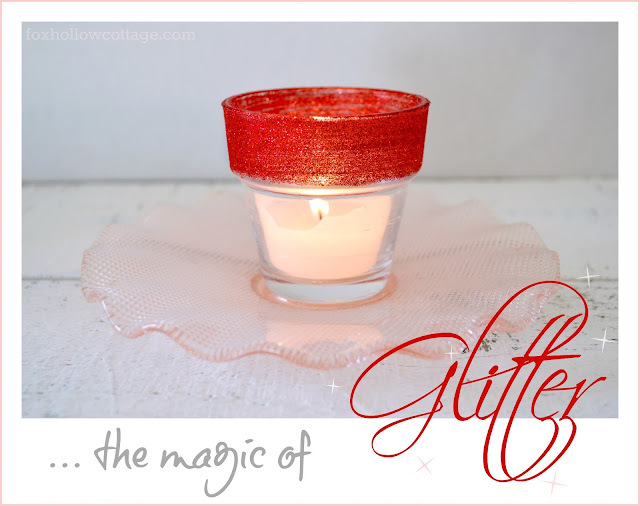 The red just pops off your blue mantel wall. Truly in love. And yes, it’s way more fun using your mind and creating something (ahem, cheaply) than just buying it. Always an original that way! 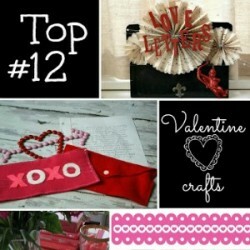 I love all of your v-day touches! The banner is adorable! Cheap and Easy Budget Style Diy Crafts and Home Decor Decorating Ideas for Valentine's Day... and everyday!